In this Interceptor Javelin build guide, we provide an overview of its strengths, weaknesses, and abilities. The Ranger is the first Javelin available, and is considered the jack of all trades. As the most well-rounded Javelin, there's little it can't do in terms of mobility, damage and utility. With access to most weaponry, and an array of Grenades to deal damage or control the flow of a fight, the Ranger can fulfill multiple combat roles. Although it lacks the hardiness of Colossus, the ranged prowess of Storm, or the mobility of Interceptor, it more than makes up for this in the fact it's adaptable in every situation. While it does have weaknesses, they aren't as severe as its peers. On that basis, and thanks to its skill ceiling, the Ranger is not only idea for new players, but also those experienced at venturing out into Fort Tarsis. Lacks the focus of its rival Javelins. 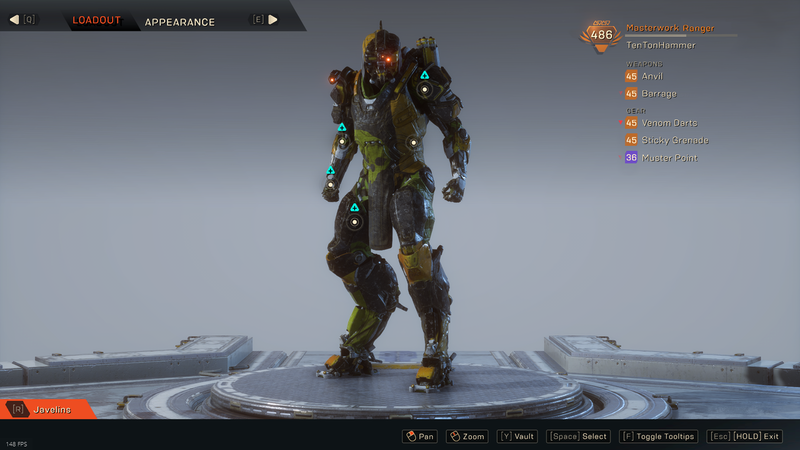 Besides the Interceptor, the Ranger is the only Javelin which can double jump. This allows him to get to higher locations quickly and easily, and ensures that if he needs to squeeze out just a little bit more height to reach a ledge, or evade, you can. Just hit [space] twice in quick succession. Shock Mace (Melee) - If you're wanting to get up close and personal, the Shock Mace will save your life in a pinch. Whether it's punishing an enemy who gets too close, or softening up a pack of opponents, the electrified mace is capable of dealing fairly solid damage. As a combo primer (Lighting) it also gives room for the Ranger to then Detonate its effect. I'll also add that if used in the air, the Shock Mace can be used again when you recover, and its initial impact (on landing) will be AOE. Multi-Target Missile Battery (Ultimate) - Capable of clearing a large amount of enemies quickly, your Ultimate ability can lock-on to multiple targets at speed, allowing you to bombard an area for a quick wave clear. If you can, try to ensure you're airborne or at height when casting to ensure line of sight against your foes. Homing Missile: Fires a projectile that seeks out a target for a small area-of-effect explosion. Pulse Blast: Unleashes a blast of pure energy, hitting a single target with incredible force. Pulse Blast acts as a Detonator, but only if you fully charge the attack. Not only that, but it also provides a small knockback when fully charged that can create some space for the Ranger. Spark Beam: Fires a sustained beam of energy for continuous damage. 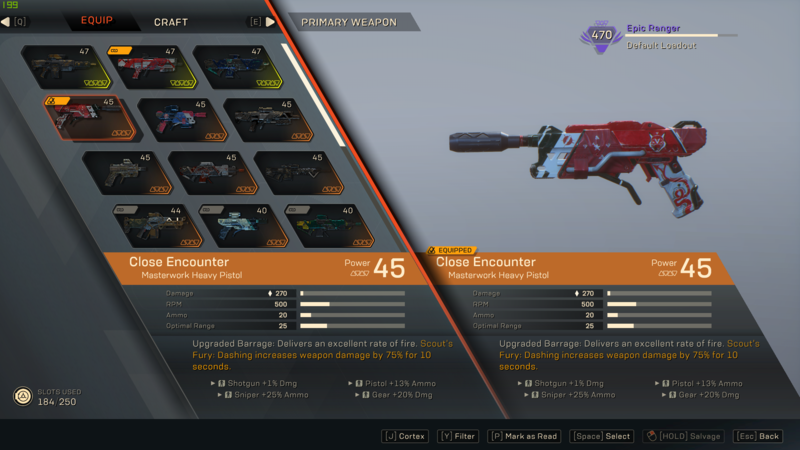 As neither a Primer or Detonator, Spark Beams value is in its low cooldown, and its focused ability to rip through shielding quickly. Despite being single target, it works really well early game and despite its potency dropping off at higher difficulties, it still proves useful versus Elite enemies. Venom Darts: Launches a volley of darts that seek out a target for acid damage. Particularly good for Ranger with a single target build, Venom Darts lower the armor of those affected, allowing you and your team to deal increased damage. As a Primer, it's also brilliant to follow-up with a grenade Detonator for massive single-target damage. Blast Missile: Fires a missile that explodes for area-of-effect damage. Despite being neither a Primer or Detonator, Blast Missile offers considerable AOE potency with a relatively short cooldown. For softening up enemies who're packed tightly together, or trapped with Frost crowd control, it brings significant value to a team fight. Just be conscious of the fact the missile doesn't home on. Frag Grenade: Deals impressive damage in a large area of effect. As your bread and butter grenade, the Frag is still one of the most potent as it's an AOE Detonator. For enemies affected by an AOE Primer (from a Javelin such as Storm) it allows you to quickly deal high amounts of AOE damage to trigger your combos. It's also great after hitting enemies with your Shock Mace, as it'll consume the Lightning Primer. Inferno Grenade: Ignites an area, dealing damage and setting enemies ablaze. As a primer, it's amazing in a confined space or when there are multiple enemies, as you can then instantly detonate those affected for huge damage. Frost Grenade: Damages and freezes enemies in place. The Frost Grenade is undoubtedly one of the strongest available to the Ranger, as it prevents enemies performing an action. As a Primer, it also means the Ranger or his team can then detonate on those affected. While the default damage on the Frost Grenade isn't amazing, its value is in the control it provides and the breathing room it gives the Ranger to escape or reposition. Seeker Grenades: Splits into smaller sub-munitions which seek out the nearest enemy. As neither a Primer or Detonator, Seeker Grenades aren't used often. However, their damage is considerable as their automation once launched ensures you'll hit multiple targets - gaurenteed - without the need for perfect aim. Sticky Bomb: Attaches to a single target for a contained, high-damage blast. Combined with Venom Darts, Sticky Bomb affords the Ranger with his highest single target combination. With the Sticky Bomb also acting as a Detonator, it works exceptionally well when released after your team have setup a combo, especially when you consider the Ranger deals increased damage when he triggers one. Bulwark Point: Deploys a spherical field which deflects incoming enemy projectiles. In the grand scheme of things, however, the Bulwark Point is in desperate need of buffs. It gets destroyed instantly by almost all enemies, and at most, will mitigate just one shot against you. Although it will last until destroyed, it simply doesn't last long enough to bring value to the Ranger's kit. Muster Point: Creates a field which increases weapon damage for teammates who enter its radius. Undoubtedly the go-to Support Gear for Ranger, the damage bonus of 20% is significant, and the buff lasts for 10 seconds even after you leave the Muster Point radius. For burning down a boss, or large group of enemies, it's pretty awesome. There's two builds available for the Ranger that are considered "end-game". The first is AOE that focuses on clearing large groups of enemies (Frag Grenade + Pulse Blast), while quickly charging your Ultimate. The second is massive single target damage through Venom Darts and a Sticky Grenade. Most of the time, Bulwark Point simply isn't worth taking. Even at Epic standard, it dies in a single hit and has a long cast time. It isn't even strong enough to help the Ranger revive a player, as it just gets destroyed instantly. Instead, grab Muster Point. The damage bonus of 20% is huge, applies to all those in it, and lasts for several seconds once you exit. Save your Venom Darts + Sticky Bomb for the buff, and you'll rip through a single target enemy. In an ideal world, you want to be locating a Thunderbolt of Yvenia or Close Encounter. Both offer massive damage potential, and while I've not yet been lucky enough to obtain Thunderbolt, there's no mistaking that both are the go-to for ranger. 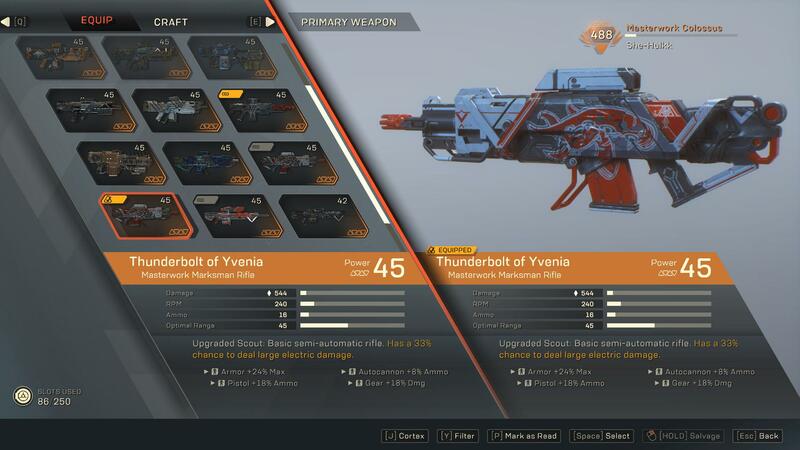 With Thunderbolt offering massive burst on a 33% chance, and Close Encounter (Barrage pistol) increasing damage by 75% after dashing, the output potential of the Ranger is huge. If you're going for a single target build, you'll want Sticky Grenade (The Gambit). If you're going for AOE, take the Frag (The Last Argument). The Ice Explosion bonus on the Sticky Grenade is great because Ice gains a 25% damage bonus against shielding. It also means you can further combo off those affected. Where the Frag Grenade is concerned, the 700% Ultimate Charge from hitting enemies is just obsurd. Either way, you're going to be dealing a lot of damage. 2. The Ranger is capable of dashing quickly in any direction in order to avoid damage. Make use of it! 3. If you Barrel Roll while flying, you can avoid attacks while in the air. 4. Unlike the Interceptor, you need to wait for a short duration to replenish your shield. Treat it like Halo. 5. The Ranger excels at nothing, but isn't particularly bad at anything either. It's a safe pick that works well in almost all content. 6. Grenades are brilliant for softening up enemy packs. Throw it instantly, or hold the button down to target the throw. 7. The Ranger is particularly strong against single target enemies, with various loadouts available that help him deal massive damage (Poison Darts + Sticky Grenade). 8. You rely heavily on your weapon as a Ranger. Use cover regularly to reduce the prospects of being hit.